There are few things more panic-inducing than being stuck in a lift. What about being punished for trying to escape? 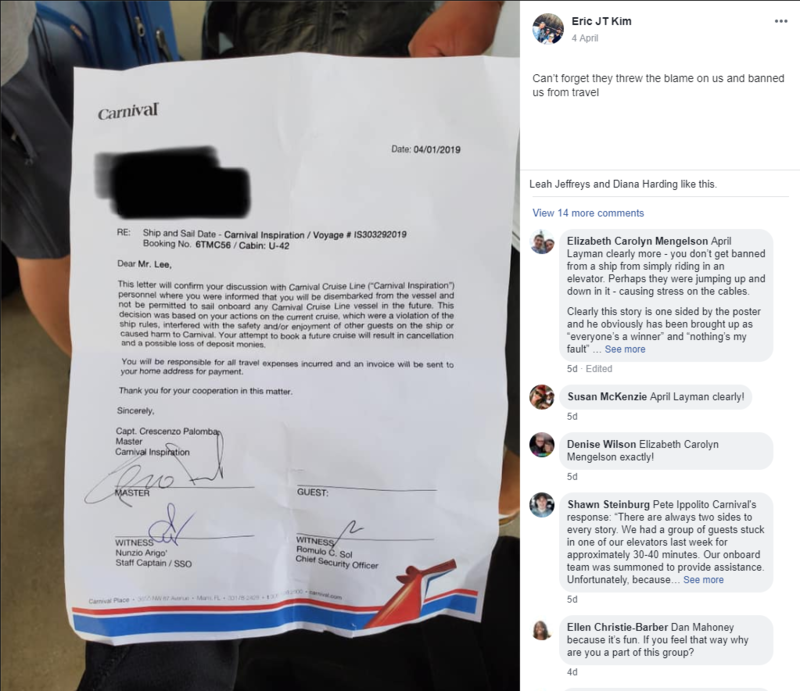 A passenger on board a Carnival Cruise Line ship claims he and his travelling companions were “mocked” and received lifetime bans from sailing with the line after they became stuck in a lift. But the cruise line claims there are two sides to the story. 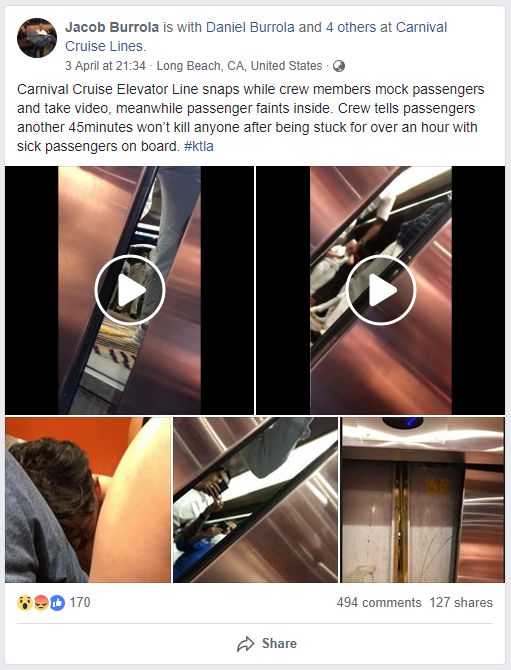 Jacob Burrola posted to Facebook detailing the ordeal, claiming the elevator line had snapped and crew members were mocking and filming them while they were trapped inside. “Meanwhile, passenger faints inside,” he said. The post was accompanied by photos showing the lift door partially opened with what appears to be a staff member taking a photo or video on their phone and two videos of the passengers interacting with staff members trying to free them. Eric Kim, one of Burrola’s companions commented on the post claiming Carnival had placed the blame on them and issued a ban. Travel Weekly reached out to the cruise line to get their side but is yet to receive a response. However, according to a statement obtained by Fox News, the ban was due to “extensive damage to the elevator doors and cabling caused by the guests” and “their behaviour towards both other guests and crew”. “There are always two sides to every story,” the statement read. “We had a group of guests stuck in one of our elevators last week for approximately 30-40 minutes. Our onboard team was summoned to provide assistance. Unfortunately, because of the extensive damage to the elevator doors and cabling caused by the guests, the work took longer than expected. Many have since commented on Burrola’s post suggesting he and his group had been jumping up and down in the lift, causing damage to the cabling. Burrola has not responded to these accusations. News of 'death penalty' for Thai airport selfies labelled "fake"
How could they possibly have caused damage to the cabling? Or the door fo that matter given they woudl not have had any tools apart from their own arms and legs! And we’ve got the recipes so you can make your own spooky cocktails at home! Or at work, like we did… Don’t tell our boss.